How can I get a file from my computer onto my cellphone without connecting it over USB? GuardianEdge is an encryption program which allows the corporate security guys to ensure that files from your company computer are not transferred to portable media without being encrypted. This make sense from a security standpoint, you do not want corporate secrets or personally identifiable information (PII) to get out into the world un-encrypted and potentially lose-able/steal-able. GuardianEdge works by detecting connection from a USB portable device to your computer. It installs a copy of itself onto the portable drive automatically. When you copy a file to the portable drive, Guardianedge intercepts the transfer and forces you to select an encryption key. This can either be a username/password or a X.509 cert in a Common Access Card. Unfortunately this become a pain in the arse when you have something personal you need to take home with you. Yeah yeah don’t use your work computer, but sometimes it is just convenient to do it at lunchtime. In my case I wanted to download a podcast and listen to it on the way home in the car (which happens to be vaguely work related anyway). If you have the ability to – upload your files to dropbox and then down again to the phone (assuming you have corporate access to dropbox or some other similar). This is fine but then I have to download the file to the cellphone anyway which is what I was trying to avoid in the first place. Activate the “3G Wireless Hotspot on the phone” and connect to your phone using your computer’s wireless connection (AndroidAP is the default SSID) – even if you haven’t paid for the mobile hotspot subscription, this still creates the wirelss connection between the computer and the phone. I strongly recommend access to your wireless hotspot either by MAC address or turning on encryption. 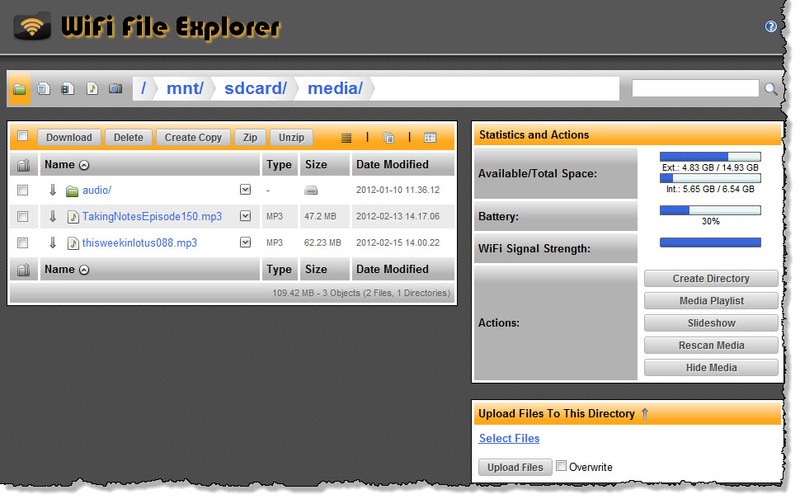 Using the excellent “WiFi File Explorer PRO” I was able to connect to the SD Card on the cellphone, over the wifi connection. Using the web based interface I was able to upload the file from my computer to the cellphone without using USB and therefore bypassing GuardianEdge. I do not sanction or encourage the bypassing of corporate security in any way. Remember – you are responsible for your actions, not me! ← what do you call a scary ghost bee?